Cut the chicken breast or steak whatever you prefer in strips. Use two skillets, one for the meat and one for the vegetables. Heat the skillets and add the olive oil. Add to one of the skillets the chicken strips and brown on both sides. Add the vegetables to the other skillet. That shouldn’t take longer then 5 min. Add 2 tbsp fajita seasonings to the skillet with the meat and 1/4 cup of water. Take the vegetables out of the skillet and put on a plate. Clean the skillet with paper towel and add 1 tbsp olive oil. Put one tortilla in the skillet and brown. 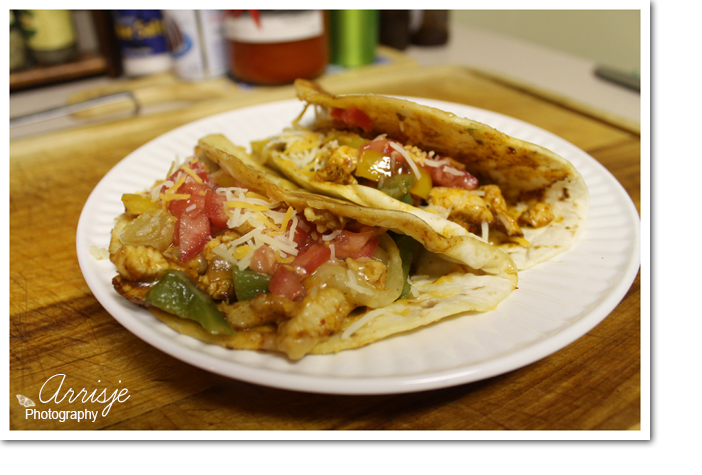 Flip the tortilla over and add to one side of the tortilla the chicken, the veggies and cheese. Fold the other half over the chicken and veggies. Add the Greek yoghurt or sour cream and salsa to the fajita. Cut the chicken breast or steak whatever you prefer in strips. Use two skillets, one for the meat and one for the vegetables. Heat the skillets and add the olive oil. Add to one of the skillets the chicken strips and brown on both sides. Add the vegetables to the other skillet. That shouldn't take longer then 5 min. 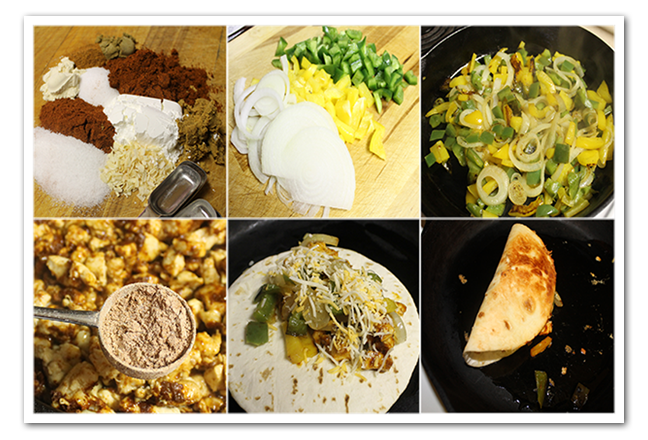 Add 2 tbsp fajita seasonings to the skillet with the meat and ¼ cup of water. Take the vegetables out of the skillet and put on a plate. Clean the skillet with paper towel and add 1 tbsp olive oil. Put one tortilla in the skillet and brown. Flip the tortilla over and add to one side of the tortilla the chicken, the veggies and cheese. Fold the other half over the chicken and veggies. Add the Greek yoghurt or sour cream and salsa to the fajita.